Political parties rarely survive on static social bases in a democracy. The BJP has been experimenting with shifting its social bases and coalescing them in a formidable vote bank in every round of elections, be it state assembly polls or general elections. And the last full union budget presented before the 2019 Lok Sabha elections must be seen in this context. Take for instance union finance minister Arun Jaitley’s thrust in the budget – away from the BJP’s traditional voter base and towards the rural sector, farmers and the poor as well as the burgeoning ‘neo-middle class’ which does not constitute the classical voluble middle class. Though this section is economically weaker, it carries enormous political weight. There are some genuine complaints that salaried or tax-paying middle class has been ignored or taxed unreasonably. But such complaints hardly matter when it comes to realpolitik. In the new scheme of things, the focus is shifting elsewhere. The move to enhance the MSP to 1.5 times of the cost to farmers, accompanied with the proposal to create robust chains of warehouses and market supply mechanisms, is bound to generate economic activity to an unprecedented level. Even if these promises are only partially fulfilled, they will neutralise the rural distress and unleash a huge economic potential. Similarly, the promise to cover 10 crore families under the Rs 5 lakh health insurance cover is expected to bring about an attitudinal change in how we look at poverty. The proposed health insurance scheme, already billed as ‘Modicare’, will give rise to the unprecedented expansion of healthcare facilities across the rural parts of the country. The government’s move to put traditional therapies like Yoga, Ayurveda and Unani on par with allopathy, as genuine medical practices, is expected to give boost to a large section of skilled manpower who is still treated as pariahs by the social elite. Though the budget aims to bring into its fold a varied section of subaltern society, the question is, how will it get translated into votes? After all, the Congress has tried similar experiments by bringing in laws like those for Right to Education and Right to Food but failed to convert them into votes. Today, nobody asks whether Right to Education or Right to Food is relevant any longer. Herein lies the difference between the Congress and the BJP. Unlike the Congress, the BJP has of late honed it organisational machinery into an apparatus that works in tandem with the government’s plans and reap political dividends to the maximum. In his seminal work, “Party Building in a New Nation” (1967), which focused on the Congress in post-independent India, American political scientist Myron Weiner pointed out, “A society with a high organisational capacity appears to be competent at creating industrial organisations, bureaucracies, political parties, universities and the like.” Though the Congress in the post-independent phase displayed a high organisational capacity, the party had turned into a disheveled and disorganised entity by the turn of the millennium at the organisational level. The party’s inability to capitalise on its own government’s welfare programmes in successive elections speaks volume about the decrepit organisational structure of India’s Grand Old Party. Contrast this with the BJP which began with a lot of scepticism on account of its projection of as a pro-Hindu and pro-upper caste (Brahmin-Bania) party with influence not exceeding beyond the Vindhya range or across the river Karmanasha that divides Uttar Pradesh and Bihar and the eastern part of the country. True, the BJP began with a limited social base of Hindutva which got consolidated at the height of the Ayodhya movement. But as long as the party was content with the accretion of these social bases, its influence was gradually withering away. That is the precise reason why the BJP lost its stature in UP till the advent of Narendra Modi on the national scene in 2014. The impression that Modi got unstinted support of a ‘communalised’ middle-class across the country is eminently erroneous. The fact remains that the BJP under Modi’s leadership spread its influence across various segments of the non-Muslim society and turned them into a formidable support base. No doubt, the support of an aspiring middle class was critical in terms of creating a perception. But that alone did not sail the BJP through. In his 1996 study focusing on Gujarat, titled “BJP’s rise to power” (Economic and Political Weekly), sociologist and political commentator Ghanshyam Shah has vividly described how the party was able to co-opt various sections of society, like scheduled castes and tribes, in additional to urban middle class. Over the years, the party has been able to wean away the Congress’s traditionally strong support bases from it and assimilate them into its fold through mobilising its organisational machinery. The most recent and the most successful example of this was the Uttar Pradesh elections of last year. The BJP’s mammoth majority, confounding all political experts, was thanks primarily to its micro efforts to reach out to a whole array of smaller castes and communities and promised them a share in power. There is a marked difference in the politics of the NDA I under Atal Bihari Vajpayee and NDA II under Modi. 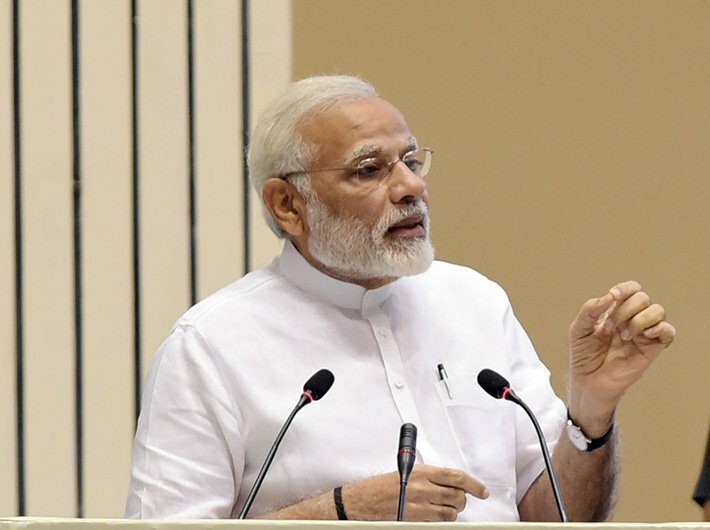 Unlike Vajpayee who saw himself as a statesman concerned with only the larger picture and macro issues, Modi comes across as a hands-on man when it comes to organisational matters. In his role as the prime minister, he never gives organisational issues less priority than issues of governance. That is why he chose as the party president Amit Shah who created a robust organisational apparatus to work in tandem with the government. During Vajpayee’s time, the government and the party were often seen working at cross purposes. As of now the BJP seems all set to launch a vigorous organisational campaign which will be closely aligned to social welfare schemes which the budget has proposed to initiate. Since these schemes promise to include nearly half of the population, the government and the party would acquire pre-eminence of principal pole in the 2019 elections. This substantial shift in the social bases is bound to radically transform the BJP internally and make it a strong political organisation compatible with the government, quite akin to the situation that the Congress had achieved in the post-independent phase. Such shifting and rearranging of social bases of the BJP is its strength, not vulnerability.